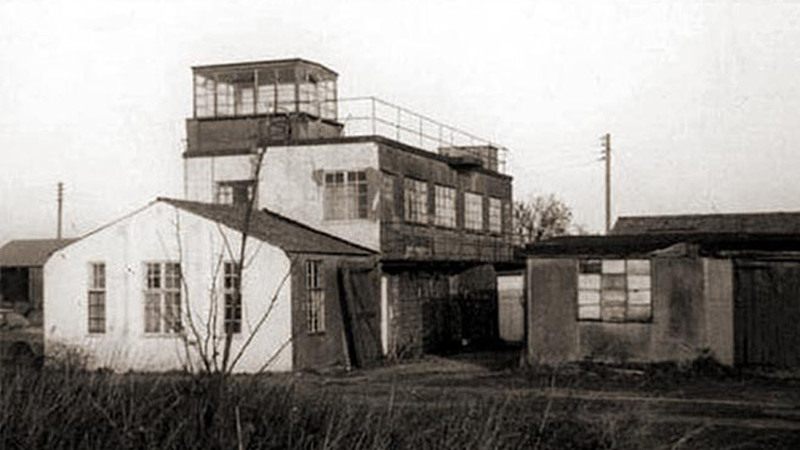 The airfield which is located west of Holton le Clay, was originally Grimsby Municipal Airport from 1 July 1932, a very successful air taxi service was operated by North Sea Aerial and General Transport Ltd and East Yorkshire Motor Services Ltd. (Waltham control tower 1970. Pic Credit: Harry Blades). This provided a convenient link between Grimsby and Hedon aerodrome, Hull. At the height of its operation several flights were flown between 09.05 and 17.20 daily. In 1938, the Air Ministry selected Waltham for one of the Elementary and Reserve Flying Training Schools (E&RFTS). Set up and run under civilian contract, 25 E&RFTS was established at the airfield. At the outbreak of WWII, all civil flying was suspended and in May 1940, the airfield was requisitioned by the Air Ministry. Grimsby of Waltham as it was commonly known, was to become airfield for 1 Group. From the outset, concrete runways were laid. These were extended in 1942 to Class ‘A’ standard length and were linked by a perimeter track, off which 30 aircraft dispersals were provided. The technical site was off the western perimeter track and contained one of the T2 hangars, as well as the original flying club hangar. A further T2 was located off the eastern perimeter track and a B1 hangar was later added to the north of the airfield. Communal and accommodation sites were built behind the technical site towards and within Waltham village. The airfield had two bomb stores, the original located to the north-east of the technical site, with the second, later addition, to the south across Cheapside. On 26 November 1941, Wellington bombers of 142 Squadron arrived from Binbrook. The squadron had been involved in night flying tests prior to moving. However, problems with insufficient taxiway lights curtailed these flights. In December 1942, 13 aircraft from 142 Squadron left Waltham for Blida, Algeria. The remaining section moved to Kirmington that same day. On 14 December 1942, 100 Squadron reformed with Lancasters at Waltham and on 25 November 1943, ‘C’ Flight was used as the nucleus for 550 Squadron. It operated from the airfield until 3 January 1944, when it moved to North Killingholme. On 1 April 1945, 100 Squadron left for Elsham Wolds due to the deteriorating condition of the runways. Today all three hangars still stand although the eastern T2 is partially obscured by additional buildings. Sections of runway and perimeter track remain and on the technical site several buildings including the watch office are still evident. To the north is a lay-by off the A16 (which cuts through the eastern edge of the airfield), there stands a memorial dedicated to 100 Squadron. At the former main entrance, a board commemorates 100 Squadron and 142 Squadron. At Waltham Windmill is a Northern Lincolnshire Aviation Heritage information board. A Nissen hut close to the windmill formed part of the WAAF (Womens Auxiliary Air Force) site and now contains memorabilia relating to the airfield.